My sole bento from last week. Life has been keeping me from the kitchen. Hopefully, next week will be nicer to me because despite the multitude of choices, choosing what to buy for lunch is becoming increasingly difficult. 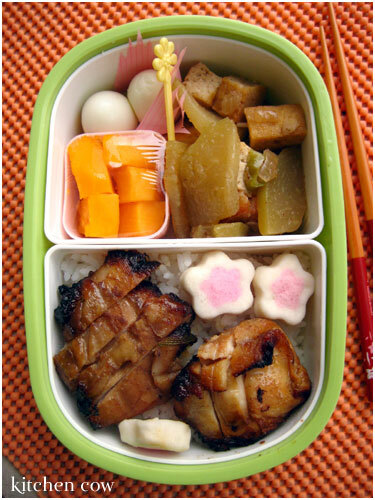 Coupled with the recent slew of rainshowers, packing bento is just what the doctor orders. â€¢ Quail eggs, hardboiled. Easy bento filler, hehe. â€¢ Gising-gising. A spicy dish made of tofu, sayote (chayote), pork and finger chilis, this dish literally means “Wake Up! Wake Up!” Named for the spiciness probably, when I was growing up, I’d always pass this dish up because the chilis scared me. Now that I’ve learned to eat spicy food, I have a hard time looking for this particular dish. Recipes, a local restaurant (which I love btw <3) serves Gising-gising as well, but I have to admit being disappointed because it was made of string beans and coconut milk---definitely not the Gising-gising I grew up with. This version, made up by one of my Aunts, is derived from the one we used to buy from Enga, a local Chinese eatery in Sta. Ana. I’m not sure if the eatery’s still there, or if it’s still run by the same people, but with this approximation, at least the cravings can be curbed. A recipe is still in the works. Give me a few tries more to tweak, then I’ll post it here. â€¢ Chicken Pandan on Rice. A yummy ready-to-cook chicken dish that I have just discovered last weekend. It was one of the grocery items I purchased from the chicken counter at SM Hypermart in Molino. The chicken was wrapped in Pandan leaves (screwpine) then marinated. I deep-fried it while still wrapped in the pandan leaves. The result? Moist, flavorful chicken that just pulsed with fragrant pandan. Definitely something I’d buy again. â€¢ FANCY FISHBALLS! Admit it, you guys missed this cute processed fish product! And speaking of fancy fishballs, I managed to snag a bounty of even fancier fishballs from that same SM Hypermart trip. I cooked said fancier fishballs in bonito stock laced with a little soy sauce and it came out wonderful. Details? They’ll be coming soon. Well, as soon as I can manage to cook the rest of my stash. As always, your bento photos are a real treat! Yeah they have ready-to-cook everything now. No, chefs (and chefs in training like me) don’t look down on prepared food. The joy of cooking from scratch is incomparable but who has the time? I must try that pandan chicken sometime and compare it to homemade hehe. Something you might wanna try: poach it in oil instead of deep-frying: Start with room temp oil and bring it to a boil very slowly, til your product is done. It takes a lot of patience but the results are great! Fancy fishballs? I must confess I haven’t had the pleasure hehe. Saan meron nyan? Hey kaoko are you going to the Mrs. Fields event tonight? Seeya! Booo! Wala akong ride, and I don’t want to commute in an unfamiliar area solo. And I was so looking forward to seeing everyone again. And fancy fishballs are available at your closest suking SM 😛 Nothing fancy tastewise, but I do love the cute factor they bring to bento.